This Fun,Easy Project includes a Matchbook Cover that has been sized to hold 10 Note Sheets that are also included in your purchase. Print the project as a full page sheet in your printing program, reinsert and print the Background on the reverse side, cut out the Matchbook Album Cover and Note Sheets, and then follow the Assembly Directions given as a link to a YouTube Video. Finally, tuck your matchbook into your purse or wallet to doodle or jot down reminders during your day. This is a Seneca Pond Crafts exclusive design, and no commercial licensing is required, except you may not resell the Digital Files, Template, or Directions for others to print out - Enjoy! You will receive TWO 3D Pyramid Ornaments with Halloween Images on all sides. There is a Vintage Witch and Owl for your Home or Party Decor. Before gluing all of the flaps, add some candy as a Fun Surprise for all of your Trick or Treaters. Raw Graphics with Kind Permission of Susan Darter. This is a Seneca Pond Crafts exclusive design, and no commercial licensing is required, except you may not resell or share the Digital File for others to print out. Be Brace ... Color Outside the Lines! You will receive BOTH of these 5.00" X 7.00" Black and White Adult ChristmasColoring Book Pages to use with your favorite mediums: Colored Pencils, Markers, Watercolors, etc. They would make Lovely Card Fronts or Framed Prints for Your Holiday Greetings and D�cor. Enjoy! To Download this Free TRY ME Printable, just click on the link below to be taken to a new window where you can save the file to your computer. You are welcome to invite your friends over to download the Free Craft of the Week also ... the more, the merrier. Enjoy! This is a Seneca Pond Crafts exclusive design, and no commercial licensing is required, except you may not resell the Digital Files for others to print. You may, however, sell the Napkin Rings as Finished Handcrafted Products. Enjoy! Please feel free to send your friends over to download this FREE Try Me Project ... the More, the Merrier! To obtain your download of this Freebie, please click on the link below for an Instant Download. 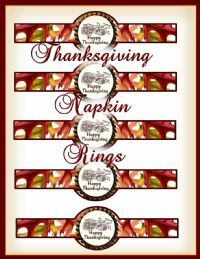 You will receive the Graphics and the Directions for Printing and Assembling this Vintage Thanksgiving Booklet and Coordinating Envelope. You will have the Option of using the Booklet as a Dinner Invitation or as a Thanksgiving Greeting Card for family and friends. The finished project is post office regulation size, so you may send it through the mail. Finished products using this project may be sold commercially, but the Graphics, Template, and Directions themselves may not be copied by any means and/or sold. Thank you! Enjoy this FREE Printable Project by Simply Clicking on the Link Below to Download the File to Your Hard Drive for Printing. Please send your Friends over to Download the FREEBIE also ... THE MORE, THE MERRIER!!!! !